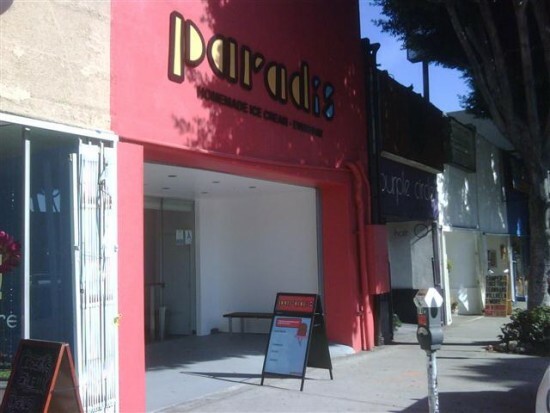 The former storefront of the Los Feliz Pinkberry on Vermont, vacant since last fall, has given way to Paradis, a new ice cream store in the area which just opened on April 7. Barely two miles from the new-legendary Scoops in East Hollywood and from Silver Lake’s Pazzo Gelato, the new shop seems to fill in the ice cream void in Los Feliz — the only other ice cream place in Los Feliz (not counting the Thrifty counters at the Rite Aid) is the Baskin-Robbins on Western Avenue – directly a mile to the west. Though totally remodeled, the interior is just as spartan and sterile as the previous Pinkberry, trading in the lime-green-and-white for red and silver. 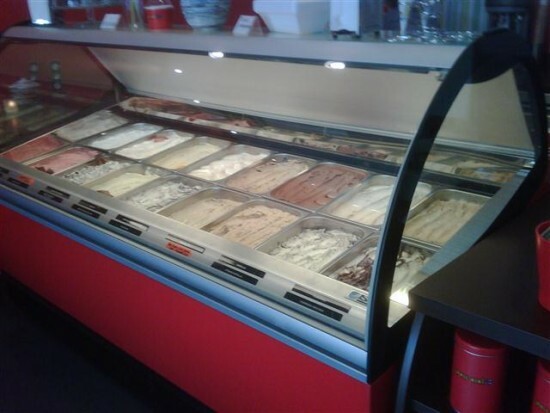 But far from an indie shop, Paradis is actually an ice cream chain based in Denmark. This is actually Paradis’ second store internationally; they also operate a location in Montrose. Apparently overseas ice cream operations, like New Zealand Natural, see Southern California as an important test-bed for the international/US market. I ended up having a scoop of stracciatella (a vanilla with chocolate shavings) and cappuccino chocolate chip, on a cone. Cost me $4.50, but at least the waffle cone didn’t cost any extra. Pretty good stuff, although any ice cream on a warm day is good. They do boast that they make their ice cream in-store with fresh ingredients. Paradis doesn’t have the eclecticism or value of Scoops or the boldness of Pazzo Gelato, but not a bad addition to the ice cream scene. I wouldn’t go out of my way for this, but would definitely come back whenever I’m in the area. Paradis will throw a grand opening celebration on Saturday, April 30, with free ice cream from 12-4 p.m. The Great FroYo wars of the late-2000s (won-out by the bang-for-your-buck Yogurtland chain) proved that it was nothing more than a passing fad. But ice cream is timeless. Paradis, 1726 N. Vermont Avenue, Los Feliz. Open Sunday-Thursday, 12-10 p.m.; Friday-Saturday, 12-11 p.m.
For what it’s worth, “Hollywood Gelato Company” is actually only 3 blocks East at 1936 Hillhurst Ave. That said, I’m happy that there’s another dessert shop on Vermont and I hope they have better luck with the location than Pinkberry did. Okay, I just called the folks at Paradis. Apparently the free ice cream party has been pushed to May 7 (they’re waiting on a shipment of ingredients and supplies from Denmark). Apparently you can still stop in on the 30th and try to get a free cone, but that’s strictly as a courtesy to folks who aren’t apprised of the new date. Also thanks for the skinny on the Paradis Grand Opening. What do they really need from Denmark? Can’t they just order it from Solvang or something? For the record, I’m a Scoops loyalist. Been a customer since their first week. But having an ice cream place within half a mule radius of everyone is a human right!